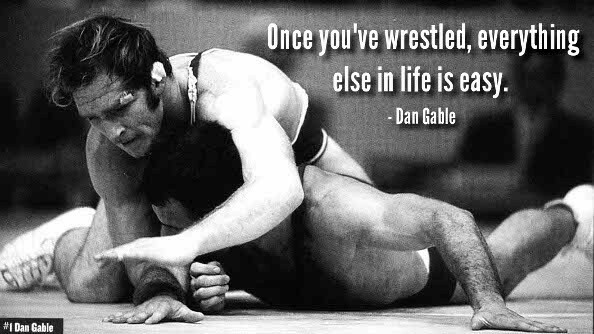 I have been a fan of Dan Gable for as long as I can remember. I don’t know if the sporting world will ever see such a dominant athlete again. He wasn’t just a legendary wrestler though. Dan Gable was equally successful at developing other wrestling champions. Such dominance is rarely seen individually as an athlete or coach. To accomplish what he did on both fronts is beyond impressive. This entry isn’t about Dan Gable’s past success however. Instead, it is about another wrestler who has at least one thing in common with Dan Gable. Willie Burton wrestles with the same heart and determination that Dan Gable possessed throughout his career. The difference is that Willie Burton was born with cerebral palsy. In the video below, you will see an ESPN E:60 special about Willie that is narrated by Dan Gable. It’s a 12 minute video that a viewer was kind enough to upload from his phone. The footage is a bit shaky at times, but certainly does not take away from the power of this story. If you’ve ever contemplated quitting any difficult task in your life, Willie Burton’s example will offer some powerful perspective. I was literally at a loss for words after watching the video. I can’t recommend it enough. I only wish I could figure out a way to replicate Willie’s heart. Even the most gifted of athletes would benefit by possessing what he has inside. Inspirador y motivante al mismo tiempo…Hermoso video gracias por compartir ..
Saludos desde el fin del mundo CHILE. Inspirador y motivante al mismo tiempo…Hermoso vide0. This is probably the best motivational video I’ve ever seen.